The Mercedes-AMG S65 Final Edition will be unveiled at Geneva next month. Just this week, Mercedes-Benz announced the death of the SLC roadster. Before its demise, the roadster will be given a send-off with special Final Editions for the SLC300 and AMG SLC43. Sadly, this isn’t the only Mercedes model we’ll soon be waving goodbye to. 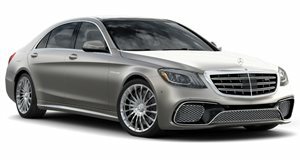 The German automaker recently confirmed its 2019 Geneva Motor Show line-up, which will include an S65 Final Edition that "crowns and brings to an end the long success story of the 6.0-liter V12 biturbo engine in the S-Class Saloon.” After that, the V12-powered sedan will be retired, and it’s probably only a matter of time before the S65 Coupe and Convertible also get the chop. While we’re sad to see the demise of the S65, it doesn’t come as a huge surprise since AMG boss Tobias Moers has already warned the company is planning to phase out the V12 unit. "There is still demand for a V12, but if you move forward with a V12 in the future, the investment will be too high, in my perspective,” Moers told Automotive News last year. "You have to increase power, and you have to move forward with the technology in that engine. We'd better invest our money into electrified V8 vehicles.” The V12 isn’t being retired for good, however, as AMG will continue to offer the powerplant in luxury Maybach vehicles. Mercedes hasn’t revealed any photos of the S65 Final Edition yet, but the sedan’s send-off will likely offer a new paint finish, unique wheels, and an exclusive interior. Power will be provided by a 6.0-liter twin-turbocharged V12 that produces a monumental 621 horsepower and 738 lb-ft of torque. All that grunt will be sent to the rear wheels via a seven-speed automatic transmission, enabling the luxury sedan to sprint from 0-62 mph in 4.2 seconds.